St. Luke's Lutheran Care Center is a non-profit corporation with 104 skilled nursing beds located in Blue Earth, Minnesota. Founded in 1963, the St. Luke's community has been expanded to include market rate housing, subsidized housing, assisted living, and adult day care services. St. Luke's Lutheran Care Center is a non-profit corporation with 79 skilled nursing beds located in Blue Earth, Minnesota. Founded in 1963, the St. Luke's community has been expanded to include market rate housing, subsidized housing, assisted living, and adult day care services. Representatives from 16 area churches meet monthly with St. Luke's administration to set policies and procedures. 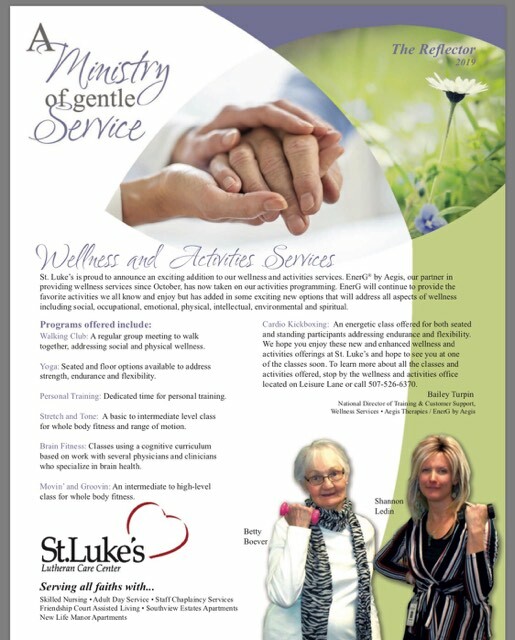 St. Luke's is staffed by approximately 200 full and part-time employees who are dedicated to providing "a ministry of gentle of service".